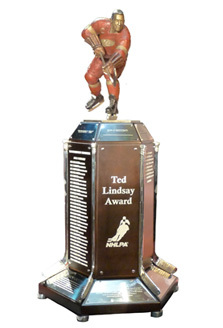 Carrying on the tradition established by the Lester B. Pearson Award, the Ted Lindsay Award is presented annually to the "most outstanding player" in the NHL as voted by fellow members of the National Hockey League Players' Association. All past recipients of the "Most Outstanding Player" are recognized together on the Ted Lindsay Award. The award is named in honour of Ted Lindsay, Hall of Fame forward known for his skill, tenacity, leadership and his role in establishing the original Players' Association. Leading winners: Wayne Gretzky (5), Mario Lemieux (4), Sidney Crosby, Jaromir Jagr, Guy Lafleur and Alexander Ovechkin (3). The first winner of the "Most Outstanding Player" Award was Phil Esposito of the Boston Bruins in 1971.